Room tip: There are steep stairs going up to the hotel from the street, so anyone with disabilities should keep this in mind. this small hotel is very well managed and well finished directly by the owner who is a helpful dear person. We stayed for a couple of nights and it was worth the price. The location is perfect for any visit in the city of Larnaka and is just opposite the Lazarus church. Suggested ! This is a very cosy and friendly boutique hotel on the St. Lazarus square in the middle of Larnaca. Stayed there for 9 nights, enjoyed the stay immensely. The rooms are rather small, but clean and the bed is spaciously comfortable. The whole hotel is located on the 1st floor, the stairway is somewhat steep, which may be of some problem for elders or hauling the luggage. There is no real breakfast, but there are cookies, fruits, tee/coffee, cereals available near the reception all day and night. Free parking available 5 meters from the entrance. Good wifi signal. Short walk to the sea shore promenade (Finikoudes). Room tip: Request a room facing the square. Somewhat noisy on occasions but the view is beautifull. What a little gem of a hotel. We stayed here for three nights in October 2016. Our room and bathroom were lovely, very clean, with a charming little balcony. There's a help-yourself counter with cereal and croissants in the morning, plus biscuits, cakes, fruit, tea, coffee, juice available 24/7. Also wine in the fridge, and we were served ouzo by the owner, all on the house. The decor is very light, lots of mirrors and bespoke wall plaques. 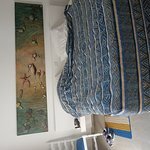 Position couldn't be much better, right on the square by the Church of St Lazarus, bars, cafes, souvlaki places right on the door step, and a couple of minutes walk from the beach and the main sea front. The staff were very, very friendly and made us feel very welcome. Our favourite place to stay in Larnaca, hope to visit again next year. Room tip: Ask for a room at the front overlooking the square. This is my second visit to this hotel and my husband 3rd. Great location not far from some great restaurants and bars.